James Gandolfini doesn’t even make it past the 30-minute mark in The Man Who Wasn’t There, yet in every respect, he looms large over Joel and Ethan Coen’s unsung masterpiece. A black-and-white homage to film noir that revels in its self-conscious adoration of the genre, the Coens’ film is a methodical, meticulous tribute. It fixates on the literal and existential crises that envelop Billy Bob Thornton’s stoic small-town California barber after he decides—in order to raise money to get in on a dry-cleaning business proposition with Jon Polito’s shady “pansy”—to blackmail Gandolfini’s department-store bigwig, whom Thornton knows is sleeping with his wife, Frances McDormand. It’s a set-up for a familiar tale of an average man who pays dearly for attempting to be something he’s not. However, before providence can adequately punish him for his hubris—a quality atypical for Thornton’s hair-cutter, who’s defined by his cigarette-puffing silence and matching impassivity—he first finds himself not only successfully getting away with coercing Gandolfini into giving him money, but also with murder. 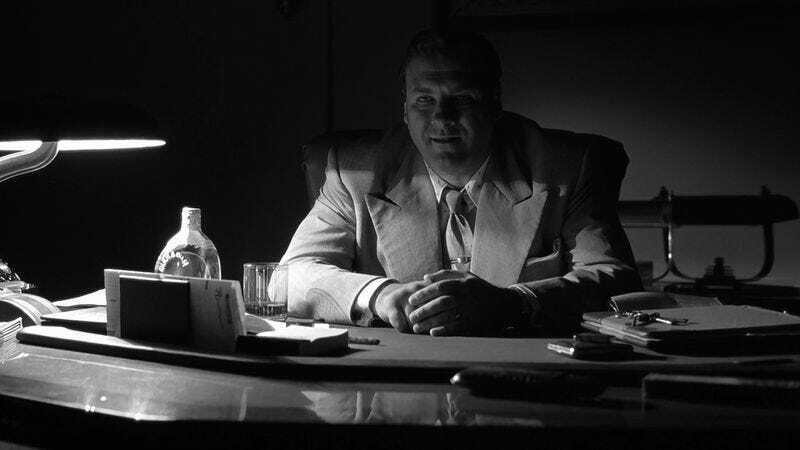 If Thornton’s cipher is the black hole at the center of The Man Who Wasn’t There, he’s merely the most profoundly empty of the film’s many blank characters, all of whom (including Thornton’s boss, Michael Badalucco, and his lawyer, Tony Shalhoub) seem to be missing some vital core of humanity. That goes for Gandolfini as well; though in a mere trio of scenes, he bestows his character—who only runs his department-store Mecca because of the benevolence of his heiress wife—with a nuanced mixture of volubility, vulnerability, and aggression that render him at once larger than life and pitifully small. First introduced as a guest at Thornton’s home, the Sopranos star reveals a charming gregariousness undercut by laughter, which telegraphs his underlying unease at being in such proximity to his mistress. After receiving the blackmail note that, unbeknownst to him, comes from Thornton, Gandolfini exposes his anxiety and panic to the barber in a confidential meeting. Gandolfini seems to shrink into his own body—an impression that’s then countered, ultimately, by a final confrontation between the two that ends with Gandolfini (now onto Thornton’s ruse) shifting from restrained rage to all-out violence, only to ultimately find himself bleeding to death on his office floor. That murder may itself play an integral part in the ensuing proceedings, but more crucially, it’s Gandolfini’s combination of weakness and wrath that lingers longest, all the way to the final twist of fate that ultimately dooms Thornton. Availability: DVD and Blu-ray, rental and purchase from the major digital providers, and disc delivery from Netflix.